How Do I Start Homeschooling My Child? Are you about to start homeschooling? Wondering how you can really get started teaching your child at home? Beginning homeschooling can be very daunting, and most people feel lost at first. I have made it as easy for you as 1,2,3! Let me take you step by step through how to start homeschooling! One step at a time, until you feel confident about making a start! Before we begin, you need to be sure that homeschooling is really the right decision for you and your family. Make sure you understand the pros and cons of homeschooling. They will help you decide if you want to take the plunge! Decided you do definitely want to homeschool? Let's take a look at the steps you need to work through. So you are ready to begin - but how? The very first step you need to take is to check out out the laws and requirements of your country or state. Understanding what is required out of will enable you to homeschool legally - and with greater confidence. Not sure how to get started with this out? 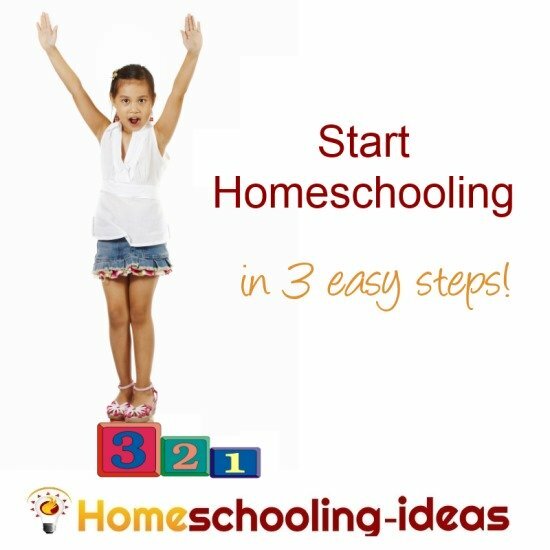 I include an easy to use worksheet in my free how to get started homeschooling workbook. Next step - making a overall plan for how you will do things. If you are taking your child out of school, then first consider whether you all need a period of deschooling. This will give everyone time to adjust - and you time to figure out exactly how you are going to do things. With the prospect of spending lots more time with your child, you may need to think about your relationship with them - and whether your good parenting skills need a brush up! What are your Homeschool Goals. What exactly do you want to achieve from teaching your children at home? Start by seeing the end result and it will be easier for you to make a plan to get there. Now is the time to do some research! There are lots of ways to teach your children at home - and you don't have to do it the way a school would. Homeschoolers have lots of flexibility in the way they teach their children - and there are lots of different methods and approaches. As well as investigating the different types of homeschooling curriculum available, take a look at some of the different ways to make a homeschool schedule. The more you learn about homeschool and the different methods available, the more you will form a picture of the options open to you. It might seem daunting so just take it a step at a time. Finally, I am sure you have a lot of questions still that need to be answered! Our final step is to look at all the other things that you may not be sure about. These are the questions that other visitors to my site have asked - so be sure that you are not alone in wanting to know the answers! Here are some of the most commonly asked questions about how to home school - and my answers. Can I Do Homeschooling? looks at the concerns about whether you can actually do this? What age should you start teaching your child? Find out what age to start homeschooling. Find out how many hours to homeschool a day. How long do you need to spend teaching your child. Should I use a curriculum? The answer to 'do I need a Homeschool curriculum' does depend on your family . Find out what you need to consider before making the decision. The cost of homeschooling does vary a lot. Find out rough estimates - and ways of making it more affordable. It can be frustrating when you have a homeschool question and can't find the answer. Please come and ask it on my thriving Homeschooling-ideas Facebook page. We are always happy to try to help. How do you actually go about trying to home-school? Find out How to Homeschool - 3 easy steps to inspiring your children to learn. Get creative. This website is all about great projects and creative activities you can use in your homeschool. Click the button below now to get inspired! Concentrate first on why you want to start homeschooling. This should give you an idea of where you are headed. Before you start getting more specific, read as much as you can on the subject - there are as many ways to homeschool as there are homeschoolers! If you can meet up with some other homeschool families, then that will give you a chance to ask questions, and begin to see the options open to you. Remember, there is no right way to homeschool. If your first steps hit a blank wall (or a blank child!) then you can easily change and adapt your approach. In fact, having a flexible attitude will really help you to be successful. As time goes on, you begin to get a feel for the process, and how it works best for your family. Homeschooling for Beginners - Things I wish someone had told me when I first begun to start homeschooling. Advice from my readers about how to get started. Things they wish they had known when they first started! Let them tell you how to get started Homeschooling. And to sum it all up - here is my How to Homeschool checklist to keep you on the right track. I wish you great joy in your learning adventure. Good luck!